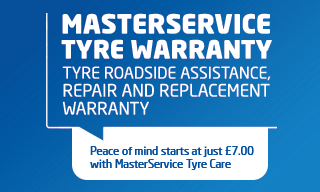 Peace of mind starts from just £7 with our MasterService Tyre Warranty. As our roads grow busier, tyre damage becomes even more common, with pothole callouts rising by a quarter in 2016 alone. At best this means a costly repair. At worse? A new tyre, which can be especially frustrating if the damaged tyre still has thousands of miles of wear left in it. MasterService Tyre Warranty entitles you to Roadside Tyre Assistance across the UK and Europe for a 3 year period from the date of purchase of the Tyre Warranty. Whether you have a blow-out or puncture, we'll change your tyre on the spot or tow you to the nearest ATS Euromaster (or Euromaster Service Centre if travelling in Europe) to sort the problem. We'll repair any tyre covered by MasterService Tyre Care free of charge in the event of a puncture. Our service includes free valves and balancing and, if the tyre's beyond repair, you’ll get 100% discount on a new one of a similar tyre type depending on how much tread is left. Call 01737 815209 if you have experienced a breakdown and our team will be able to assist you.